The State of Rhode Island, whose location is shown in red on this map, is bounded by Connecticut on the west. Rhode Island is bordered by Massachusetts to its northeast, and by the Atlantic Ocean to its southeast. Rhode Island is the 50th largest state in the United States, and its land area is only 1,045 square miles (2,707 square kilometers), including 168 square miles (435 square kilometers) of water surface area. The state is divided into 5 counties which have no county governments. This Rhode Island map site features road maps, topographical maps, and relief maps of Rhode Island. The detailed, scrollable road map displays Rhode Island counties, cities, and towns as well as Interstate, U.S., and Rhode Island state highways. The pannable, scalable Rhode Island street map can be zoomed in to show local streets and detailed imagery. to view a scalable Rhode Island road map. The detailed Rhode Island map and the regional Rhode Island map display cities, roads, rivers, and lakes as well as terrain features. The detailed map shows only the State of Rhode Island, while the regional map shows Rhode Island and the surrounding region. Rhode Island's capital city is Providence. Other major cities in Rhode Island include Warwick, Cranston and Pawtucket. In 2005, the population of Rhode Island was estimated at 1,073,579, which is about 1,029.9 people per square mile. In 2010, Rhode Island's population rose to 1,052,567 people. The state's primary Interstate Highway is I-95. The only major Rhode Island airport is the T.F. Green Airport in Providence. Rhode Island was named after the Greek island of Rhodes. Rhode Island's low-lying terrain along the coast makes it vulnerable to storms and flooding. Small lakes and bays dot the forested rural landscape, where diary and poultry farming is a way of life. Tourists enjoy visiting the mansions in Newport as well as Samuel Slater's cotton mill in Pawtucket. For Rhode Island travel and tourism information, visit the official Rhode Island tourism site and Rhode Island Atlas. This Rhode Island reference map shows major cities, roads, railroads, and physical features in Rhode Island. 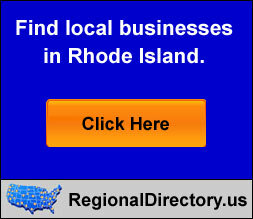 Several map publishing companies offer printed maps of Rhode Island. For example, Omni Resources offers several maps of Rhode Island that feature points of interest, airports, and parks, as well as selected local attractions and insets of major Rhode Island cities. Rhode-Island-Map.org Editor, State Maps, PO Box 775, Barnegat, NJ 08005.